Estadio José Zorrilla was built in 1982 and is named in honour of the famous Spanish poet José Zorrilla y Moral. 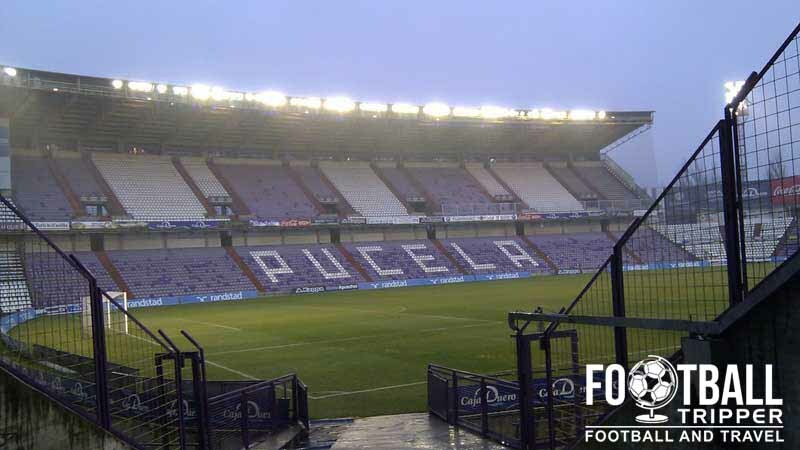 Before this, Real Valladolid played in the old 1940’s Estadio José Zorrilla. The current ground has a capacity of 26,512 with plans being formulated to expand the stadium to 40,000 spectators. The original Estadio José Zorrilla was built in 1940 and was eventually replaced 42 years later when Spain were chosen to host the 1982 World Cup with modern facilities greatly needed. Officially opened on the 20th February 1982, Valladolid took on Athletic Club (Bilbao) and defeated the visitors 1 nil with a goal by Jorge Alonso. As well as being used for the remainder of the team’s league matches, the stadium hosted in the 1982 Copa del Rey Final as a precursor to the World championships, with Real Madrid defeating Sporting de Gijón 2-1. During the Summer of the World Cup, José Zorrilla hosted three group matches: Czechoslovakia v Kuwait, France v Kuwait and France v Czechoslovakia. Although England were also in this group as well and finished first, all three of their games were played at Estadio San Mamés in Bilbao so fans may be unfamiliar with this Estadio. Since the World Cup, the stadium has undergone slight modifications most famously due to exposed sides which earned the ground the nickname Estadio de la Pulmonia (Stadium of Pneumonia) amongst fans of the club. Consisting of a single bowl-shaped tier of around 30,000 capacity, the club eventually enclosed the North end in 1986 giving the stadium the shape of a horseshoe with a capacity increase to 37,500. 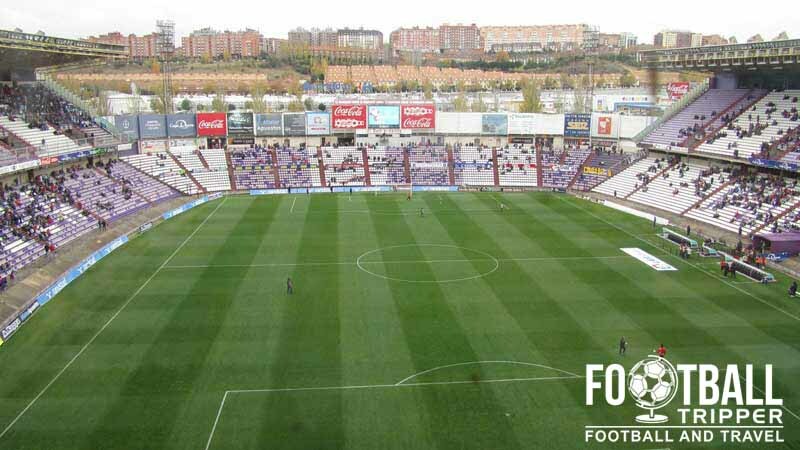 In the 1990s following a mandate from UEFA and Liga de Futbol Profesional, the stadium had to be converted to all seater which decreased the capacity to the current 26,512. 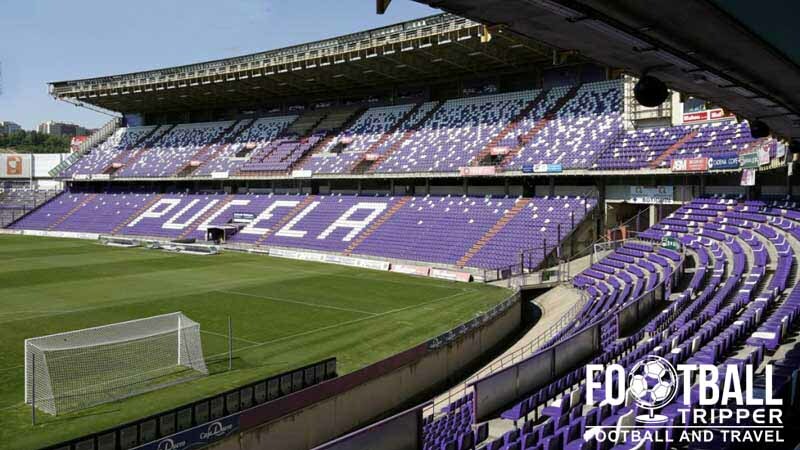 Currently there plans to expand the stadium to 40,000 capacity, which have been dubbed “Valladolid Arena” but as of yet, there hasn’t been much progress. Estadio Nuevo José Zorrilla is comprised of four stands: North, East, South and West. Real Valladolid was founded in 1928 following the merger of two of the biggest teams in the city: Club Deportivo and Real Unión Deportiva. Playing in a distinctive purple kit with vertical white stripes, the club are easily recognisable across Spain with the colour of the stadium seats reflecting the team’s unique style. Inside the pitch fans of the club known as Pucelanos offer strong support to their heroes on the pitch with the club boasting over 16,000 season ticket holders for the 2013/2014 season. 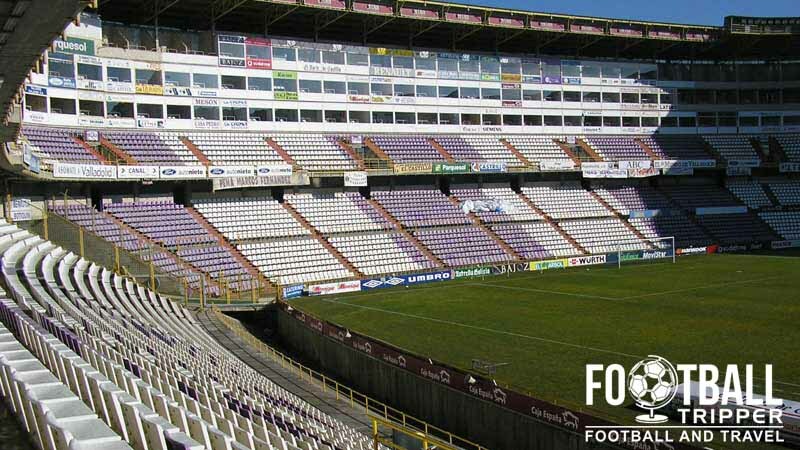 With unrestricted views throughout the stadium and stands of various proportions, José Zorrilla is an intimate footballing theatre very much in the mould of traditional English Stadiums. As a smaller side, The Blanquivioletas or Albivioletas (White and Violets) are historically the 13th most successful team in Spain with a total of 43 seasons in the First Division, and three Cup finals to their credit, with the 1983-1984 final being a victorious occasion. West Stand – Largest stand where the Presidential Boxes, Press seats and VIP areas can be found. East Stand – Second largest. Sunny and closest to the city centre. North Stand -Behind the goal. Cheap seats. South Stand – Smallest and uncovered stand behind the goal and parallel to the main road. Opposite the South stand and across the main road there is a Carrefour supermarket which can be used to grab a quick snack, but isn’t really feasible as a dining option. Luckily there is Ramiro’s Restaurant 5 minutes east of the Stadium which has good reviews, as well as more than a dozen other options behind Carrefour along Calle Hernando de Acuna road including Restaurante Morisi, Ponte Vecchio and Pizzeria Ubi Bene. If you’re seeking authentic Valladolidian cuisine then you may wish to head back to the city centre after the game where you will find a better range of options. Although very much an inland region, fish from the Cantabrian Sea such as Red Bream and Hake are an integral part of the region’s cuisine. Other specialities include Lechazo (Slow roasted Lamb), Villalón de Campos (Sheep cheese), and Pata de Mulo (Mule’s foot). Most dishes are served with bread sometimes made with pork-scratchings or more “muffin” based mixture, and wines from Ribera del Duero come highly recommended by travellers. Real Valladolid operate 4 club shops throughout the city with the largest being at the stadium itself. No information is currently available regarding Stadium tours of Estadio Nuevo José Zorrilla, but if any information comes to light, we’ll be sure to update. 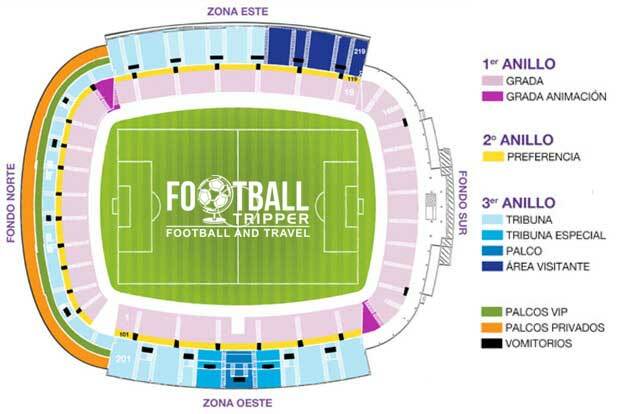 Tickets to see Real Valladolid can either be purchased Online before your trip, or at the “taquillas” (Ticket windows) either on the week leading up to the match or up to a few hours before kick off, depending on the level of demand for the tickets – obviously the larger teams such as Barcelona and Madrid attract more interest from football fans. Price range for tickets is anywhere between €23.00 for a seat behind the goal at either the North or South stands and approximately €50.00 for a fairly decent seat along one of the main grand stands. Estadio José Zorrilla is based 4km West out of town with the club detailing a range of transport options you can take here. From the city centre you will need to cross the Pisuerga river with there being three suitable bridges which can take you west depending on your location: Avenue de Jose Luis Arrese, Paseo del Hospital Militar or Calle Puente Colgante. From there the two main roads you will need to follow are either Avenue del Monasterio de Ntra. Sra. de Prado or Calle Padre Jose Acosta. Consult the map, as it’s impossible to give you precise directions without knowing your starting location! Valladolid train station is around 30 minutes away by foot and is pretty close to the river with Calle Puente Colgante from Calle de Recondo outside the station leading you across the easily recognisable Iron bridge. Once you have crossed it’s simple a case of following Avenida del Prado Monastery in a straight line until you can see the stadium. Pretty straightforward and easy to get your bearings as you are essentially heading in a straight line from the station westwards! The bus is also a good option to have with Bus number 8 departing 4 times an hour from Plaza de España on matchdays with a journey time of around 15-20 minutes. Closest stop is Calle Mon. S. Lorenzo de El Escorial (around Centro Cultural Miguel Delibes). Alternatively you can catch Bus number 9 from Plaza Madrid and both the train and bus station. Closest stop for this service is Calle Hernando de Acuña (corner Juan de Valladolid) where it is a 10-minute walk to the stadium. Another option is to cycle to the stadium, following the introduction of a Vallabici bike rental scheme which was introduced to the municipality of Valladolid a few years ago. With 31 points around the city and a system which is fully electronic, this could be a decent choice for those who enjoy an active exploratory lifestyle. Lastly if all else fails you can get a taxi or drive yourself to the stadium using a rental car where you will find over 1,500 parking spaces available for cars as well as a large supermarket across the road which offers at least another 500 spaces. Valladolid Airport-Villanubla is located 11 km North West of the Stadium and around 15km from the city centre. As the 28th largest Spanish airport by passengers volume, there isn’t an extensive range of international destinations served, but there are a number of internal flights from Barcelona, Ibiza and Málaga which can easily fill this gap, and allow you to watch some Spanish Football! The closest hotels to José Zorrilla are all found southwards behind the Shopping Centre with Meliá Hotels International SA being the stand out choice as Hotel Novotel Valladolid is a little out of the way. Heading back towards the city centre, Hotel Parque is affordable and close to the Station with Hotels Mozart and Roma being more centrally located.